We envision a world where these unjustly maligned dogs share homes with kind, loving, and competent humans, where their honor can be restored and preserved. Irresponsible owners and the media have done so much to damage these breeds’ reputations, and it is our goal to remedy the situation by educating the general public on how to properly raise, care for, and love these amazing dogs. And by encouraging owners to get their dogs involved in obedience, agility, tracking, weight-pulling, therapy work, and police work. I got to meet two handsome boys tonight, Boscoe and Shep. This first big guy is Boscoe. He was found outside on a 2 ft chain, starving and frostbitten. He’s deaf, and it’s unknown if he was born that way or due to something else. He’s 3-4 years old, does know some sign language, and sits very politely for treats! He needs to find a forever home with a lot of love, patience and understanding for his special needs. Shep was found as a stray, and he’s thought to be part Shepherd and part Great Dane. He’s still a pup at 10 months, and SO cute. He loves people, kids and other dogs, but needs a home without cats. His foster says he’s a total lap dog. If you’re interested in having your dog be a part of our fundraiser in June, just send me an email. To make a Paypal donation, click here. Be sure to check out their Facebook page! Oh Boscoe! You are SO handsome!! 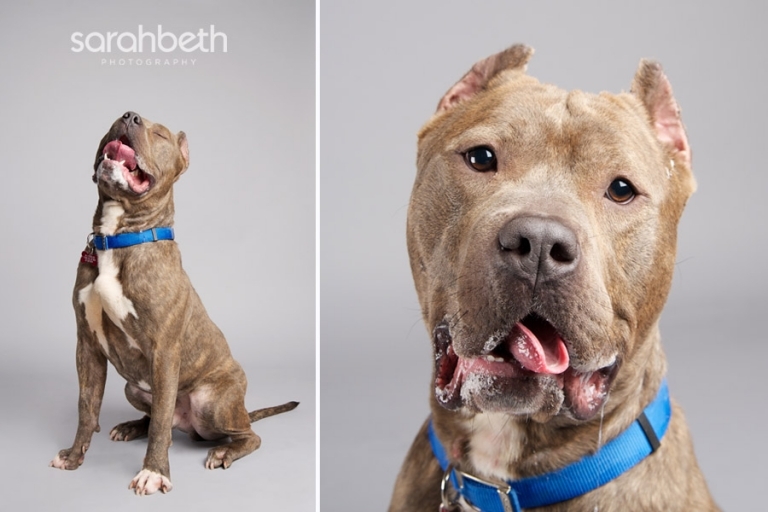 The pictures of Shep turned out so great (but since I am his foster of course I think he is adorable…Sarah you do such amazing work, thank you for doing it for Shep and Boscoe I hope this helps us find there forever homes!!! Beautiful work Sarah. Love these boys! Sarah- I love Boscoe pictures, he is at times just as happy as his pictures show, He truely is a sweet heart, He love his humans even after all he has been through. Thank you again for making Save A Bull the rescue of the month, Amazing work by an amazing lady!! Stunning work as usual Sarah!!!! Thank you!! You’ve captured them beautifully, Sarah!! !